How Do I Take Fish Oil Supplement? How Do I Pick a Good Fish Oil Product? In order to help you find a good product we’ve researched & compared the best fish oil supplements on the market right now. 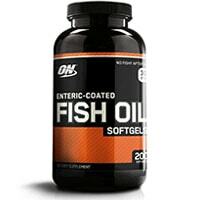 Fish Oil Softgels are a simple fish oil product made by Optimum Nutrition. Containing 1,000mg of fish oil per capsule, these pills provide all the benefits of omega-3 fatty acids, and none of the junk found in lower-quality products. With premium quality ingredients and a name you can trust, this is one product you can feel comfortable trying. 1000mg fish oil, supplying 180mg EPA and 120mg DHA. This high quality supplement contains omega 3 fatty acids, which provide a range of benefits. Who makes it: This product is made by Optimum Nutrition, one of the most popular and most respected brands in the supplement industry. Best known for their Gold Standard line of fitness supplements, Optimum Nutrition, or ON for short, truly sets the standard in a competitive industry. With a huge range of products and more than a million fans on Facebook, Optimum Nutrition is a top-notch company and a brand you can trust. 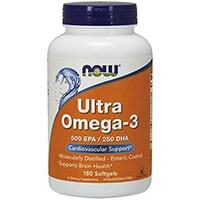 NOW Ultra Omega-3 is a simple supplement containing 1000mg of fish oil concentrate. Offering an impressive 500mg EPA and 250mg DHA, Ultra Omega-3 is a concentrated, affordable and easy way to consume fish oil. Its simple, no-frills formula make it a great choice for those wanting to stick to a clean diet and supplementation regimen. Enteric coated capsules – no aftertaste! 1000mg fish oil concentrate, supplying 500mg EPA and 250mg DHA. Who makes it: Ultra Omega-3 is made by NOW Foods, a large scale producer of health foods and supplements. As one of the largest health-food manufacturers in the country, NOW has a huge variety of products and a reputation for low prices on high quality products. 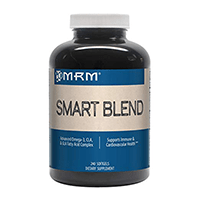 MRM Smart Blend is an innovative new product that combines so-called “smart fats” into one accessible product.It offers omega-3, omega-6, EPA, DHA, CLA and GLA fatty acids.That being said, it’s a bit inconvenient at 6 capsules per day. 260mg EPA, and 220mg DHA (from fish oil). Who makes it: Smart Blend is made by MRM, otherwise known as Metabolic Response Modifiers. Formed in 1996, MRM has grown into a major producer of health supplements, and have earned a reputation for making quality and effective supplements. 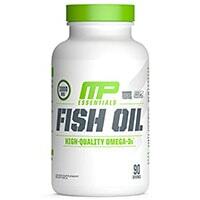 MusclePharm Fish Oil is an affordable and accessible fish oil supplement. With 1000mg of oil per capsule, and an incredible 700mg omega 3 fatty acid per serving, MusclePharm has outdone themselves with this product. Add a high-quality coated capsule to preserve freshness and a tasty citrus flavored coating, and you’ve got yourself a great choice for supplementing fish oil. 1000mg fish oil, supplying 400mg EPA and 300mg DHA. A combined 700mg of omega 3 fatty acids in each capsule. Who makes it: This product comes from MusclePharm, a large fitness supplement manufacturer based in Denver, Colorado. Since 2008, MusclePharm has grown into an award-winning, top-of-the-line company. Today, they offer a large line of high quality products and have earned the respect of fitness enthusiasts from across the globe. Orange OxiMega Fish Oil is a unique supplement made by Controlled Labs. Combining two separate products into one box, OxiMega offers both pure fish oil and a potent antioxidant blend of greens. 2000mg fish oil, supplying 800mg EPA and 400mg DHA. 3g greens formula, consisting of spirulina, ginkgo biloba, green tea extract, wheat grass juice extract, and many more. Who makes it: Orange OxiMega Fish Oil & Greens Formula is made by Controlled Labs. As one of the most innovative companies in the game, Controlled Labs focuses on using pure, clean ingredients to make products that work. Making effective, affordable, and accessible supplements is the main goal of this company – and they’ve done very well so far! 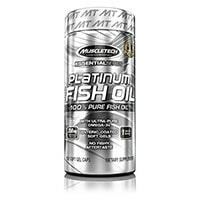 MuscleTech Platinum 100% Fish Oil is a simple product containing pure, filtered fish oil. Offering all the fantastic benefits of omega-3 rich fatty acids, MuscleTech has put together a very affordable product that provides a convenient way to get the benefits of fish oil. 1000mg fish oil, supplying 180mg EPA and 120mg DHA. Providing a combined 300mg of omega 3 fatty acids, each capsule provides a variety of benefits. Who makes it: This product is made by MuscleTech, one of the “big players” in the fitness supplement industry. For many years, MuscleTech has lead the industry in producing affordable, innovative and effective products. Ranging from protein powders to vitamins to health supplements, MuscleTech offers it all, and is one of the most trustworthy companies out there. 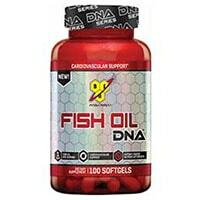 Fish Oil DNA is a simple and affordable product from BSN, providing 1000mg of fish oil per capsule. With a combined 300mg of omega-3’s per serving, Fish Oil DNA is a great way to supplement your omega 3 essential fatty acid intake. 1000mg fish oil, supplying 300mg omega 3 fatty acids (EPA and DHA). Who makes it: This product is made by BSN, a massive supplement manufacturer. Having won many awards over the years and built up a large following of dedicated fans, BSN is one of the best-known names in the industry – and for good reason: their products work! Animal Omega is an essential fatty acid supplement made by Universal Nutrition. Combining many healthy fats into one product, Animal Omega is a good way to get your daily requirements of these essential fats. 4000mg omega 3 fatty acid complex, consisting of flaxseed oil, salmon oil, cod liver oil, and more. 2500mg omega 6 fatty acid complex, consisting of borage oil, safflower oil, evening primrose oil, and more. Who makes it: Animal Omega is made by Universal Nutrition, a large sports nutrition company founded in 1977. For nearly 40 years, Universal Nutrition has been on the cutting edge, developing new and effective products to fit the needs of the growing community of fitness enthusiasts. 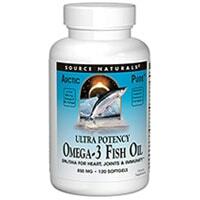 ArcticPure Ultra Potency Omega-3 Fish Oil is an effective supplement made by Source Naturals. With a high-potency blend containing 1250mg of fish oil, each softgel offers a combined 850mg of omega-3 essential fatty acids. 1250mg fish oil, supplying 450mg EPA and 340mg DHA. Who makes it: This product is made by Source Naturals, a large manufacturer of vitamins, supplements and health foods. Based in California, Source Naturals has a wide variety of health food products available both in stores and online. 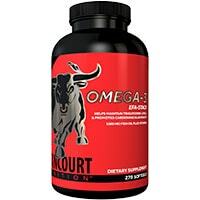 Omega-3 EFA-Stack is a high quality essential fatty acid supplement from Betancourt Nutrition. 1000mg fish oil, supplying 180mg EPA and 120mg DHA. 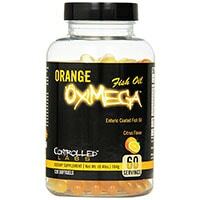 Capsules filled with pure, high quality fish oil provide 300mg of omega-3 fatty acids. Who makes it: Omega-3 EFA-Stack is made by Betancourt Nutrition. Based in Florida, Betancourt is a mid-sized supplement manufacturer with a focus on producing high quality, highly effective supplements. Fish oil is derived from the tissues of certain species of fish, including salmon, cod, and other fatty fish. Fish oil is extracted from the fatty tissues of these species, in order to provide a concentrated dose of omega-3 fatty acids, the main active ingredient in fish oil. What is omega 3? Simply put, omega 3 fatty acids are polyunsaturated fats that are considered to be essential to human health. Omega 3 vitamins are essential for many functions in the body, but they cannot be made naturally by the body. Therefore, you need to get adequate omega 3’s in your diet in order to stay in good health. In order to get enough in your regular diet, you’ll need to know the best sources of omega-3. There are many foods high in omega 3, which you should try to add to your diet. The absolute best source of omega 3 is fatty fish, such as wild salmon, tuna, halibut, and more. See a full list of omega 3-rich foods here. DHA and EPA are the two most important of the omega-3 fatty acids, although there are others. If you eat a lot of fish in your diet, you may get enough fatty acids already. If not, consider adding more to your diet. Experts recommend at least 500mg of DHA and EPA (combined), per day, although there are benefits to taking significantly more than that. If you don’t eat a lot of fish or you think you could benefit from additional omega-3’s in your diet, you should consider taking an omega 3 supplement. These supplements are usually in the form of filled capsules, that you take 1-3 times daily. Fish oil supplements are pills or capsules that you can take to increase your regular intake of essential fatty acids, such as omega 3 and omega 6. What do fish oil pills do, you might ask? Well, they offer the same health benefits as the essential fatty acids found in foods. While EFA’s consumed from food are slightly superior due to freshness, fish oil supplements can offer the same benefits. Fish oil is no magic supplement, and it’s no replacement for a healthy lifestyle. However, the evidence supporting its cardiovascular benefits is promising. A systematic review of fish oil studies found that fish oil consumption moderately improved HDL cholesterol levels. This effect is amplified when combined with aerobic exercise. Several clinical studies (1, 2, 3) have found that fish oil supplementation can lower triglyceride levels by 15-30%. A study of adults with hypertension found that fish oil doses as low as 0.7g per day showed clinically meaningful blood pressure reductions. Other studies have shown similar results. A study of 400+ high-risk patients found that daily fish oil supplementation may significantly reduce potentially fatal ventricular arrhythmias. Fish oil may have beneficial effects on mental health in some people – but it’s no replacement for medications, therapy and other treatment options. Many studies have found that people with major depression are more likely to have lower blood levels of omega-3s. The same is true of people with certain mental disorders, like schizophrenia. These findings suggest a general link between omega-3 intake and mental health. A 2010 clinical trial found that omega-3 supplementation helped to reduce the risk of developing psychotic disorders. Several studies (1, 2, 3) have found that high-dose fish oil supplementation can help to reduce the symptoms of bipolar and schizophrenic disorders. Fish oil appears to have broad anti-inflammatory effects. However, it may not benefit everyone in the same way. A study of medical students found that fish oil reduced the production of inflammatory molecules called cytokines, thereby reducing inflammation markers. A clinical review found fish oil to have significant anti-inflammatory effects and suggested its use as an alternative to nonsteroidal anti-inflammatory drugs. A study of patients with rheumatoid arthritis found that fish oil was able to reduce joint pain and stiffness linked to inflammation. Eating fish and other omega-3-rich foods appears to be quite promising in improving eye and skin health. Fish oil shows promise as well, although food sources appear to be more consistently beneficial. A study on patients with psoriasis found that fish oil supplementation resulted in a significant decrease in itching and scaling. A small study showed that high-dose fish oil supplementation was able to improve vision in patients with age related macular degeneration. It’s important to note that many of these benefits have not been adequately studied. Some studies have shown conflicting results, while others have shown no benefit at all. More research is needed in many of these applications. Many people ask us, what are fish oil pills good for? Who can benefit from taking these supplements? The reality is that everyone will experience slightly different benefits. Those who consume a lot of fatty fish may not need to take these supplements, as they get enough omega-3 fatty acids in their diet naturally. Men and Women – Both men and women can enjoy the omega 3 benefits offered by these supplements. While men need slightly more omega-3 than women, both sexes can greatly benefit from these supplements. Plus, there are rarely fish oil side effects, so there’s no harm in adding it to your supplement regimen. Vegetarians and Vegans – The best source of omega 3 is fatty fish. If you do not eat fish because of a dietary restriction or personal choice, you will struggle to get enough essential fatty acids in your diet. Therefore, vegetarians and vegans can greatly benefit from adding fish oil to their diet. While fish oil is derived from fish product, for many it’s considered better than consuming actual animal flesh. If you’re against consuming any sort of animal product, you can get EFAs from flaxseed oil or other vegan omega-3 sources. Athletes – Weightlifters, bodybuilders, athletes and fitness enthusiasts can experience noticeable benefits from omega-3 supplements. Fish oil can help reduce muscle soreness, help strengthen and protect joints, and aid in fat loss. All these benefits are very significant to athletes. Also, bodybuilders who consume a lot of cholesterol-rich foods will benefit from the cholesterol-reducing properties of essential fatty acids. Some people notice an unpleasant aftertaste when taking fish oil, or even fishy flavored burps. This side effect is easily avoided by taking fish oil with meals, or looking for enteric coated capsules. You can also freeze your capsules to slow their release, further preventing this side effect. A small percentage of users report a slight upset stomach when first beginning fish oil supplementation. If you find this to be the case for you, consider taking the supplement at meal times and not on an empty stomach. The American Heart Association says that taking up to 3g of fish oil per day is generally safe, and should not result in any unwanted side effects. It is not recommended to take more than 3g/day, unless otherwise instructed by a medical professional. Generally, it’s best to take these supplements spaced out throughout the day. Most experts recommend taking a capsule at mealtimes, which is an easy way to spread out your doses. It’s also a good idea to take these supplements with food, as taking them on an empty stomach can cause some minor side effects in some people. Since dosage amounts vary, always follow the instructions on the product packaging. The majority of these supplements contain 1000mg of fish oil per capsule, which means 3 a day is at the upper end of the recommended daily intake. Ingredients – step number one is to take a close look at the ingredients found in the products you’re considering. Does it include pure fish oil? How large of a dose? Are there any unnecessary fillers or additives? EPA/DHA content – while the amount of fish oil per capsule is important, what you should really be looking for is the specific content of EPA and DHA, the two long-chain fatty acids that are the most important omega-3’s. Brand reputation – is the product made by a well-known, well respected brand? You can read fish oil reviews to learn more. Value for money – what is the per-serving cost of the supplement? In general, fish oil is fairly affordable – but that doesn’t mean you should spend more money than necessary! Compare prices on a per-day price for best results. Convenience factor – most of these supplements will require several doses throughout the day. Keep the serving size and dosage recommendations in mind when choosing a product.